Northampton, MA based string-rock quintet Darlingside is playing at the Mercury Lounge in NYC Friday, May 25. A creative and innovative group of musicians, Darlingside captures an original sound as they carefully weave together genres of rock, classical, and folk music. 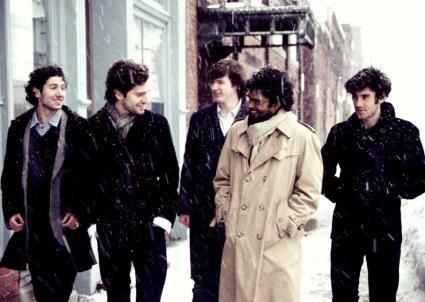 Their diverse sound can be attributed to the eclectic array of musical origins: a young classical pianist appearing on NPR; a world traveler studying music in Brazil, Turkey, and Ireland; a touring boy alto and cruise songwriter; a Boston street musician; and a drummer drawing on a mix of rock, celtic, and jazz. Their upcoming debut LP, Pilot Machines (available July 17), is a melodic work that displays the band’s innovative, ambitious style and diverse talents.